I have been able to benefit greatly from using Leg Care. 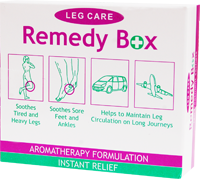 How Can Remedy Box - Leg Care Synergy Help? Leg Care Synergy is a safe and effortless way of relieving tension in the legs. If you are among those who are on their feet all day coping with the demands of hectic lifestyle, you might be frequently experiencing tired, heavy legs or soreness in the feet. Especially while travelling, whether in cars, buses, trains or planes, means sitting in constrained position for long period tires the muscles. If this happens on regular basis, it creates tension in the legs which in turn starts to interfere with the blood circulation. This can also result in problems like DVT and Varicose veins. When sachets are applied to the problem area, the molecules of the oil release their properties. As the blood capillaries come in contact, the molecules of the oil are carried away in the blood where the bio-chemical re-action of the therapeutic properties takes place. The effects of Leg Care Synergy can last up to 24 hours or from 2-6 hours in acute neuropathy. Depending on the physical exertion, the essential oil components are released from epidermis into the dermis. Talking Shop Magazine :: Give your legs a lift! I have purchased Leg Care Synergy and I found very helpful and already am on my second bottle since last week.